Kim Storey is an educator, designer, and producer who specializes in creating innovative educational media for children, parents, and educators. Teaching science to preschoolers? When I first entered the field of education—and children’s television—no one thought that you could or should teach science to children that young. Today we know that young children have great capacities to learn science concepts and get engaged in doing science. Children are naturally curious about the world and how it works, and science learning for young children starts with wondering and asking questions. Back in the 1950s, Theodor Geisel, aka Dr. Seuss, created “The Cat in the Hat” beginning reading books in response to concerns that American children were lagging behind in literacy. The Cat in the Hat revolutionized teaching reading to young kids. Now more than half a century later, it’s helping teach science to young children through the new PBS TV series and websites, The Cat in the Hat Knows a Lot About That! As KQED’s director and creator of the educational resources for The Cat in the Hat Knows a Lot About That!, my role was to design websites for parents and teachers that extended the learning from the TV programs. Websites connected to children’s PBS programs provide another way to help parents and teachers use quality educational programming to help children learn. The television series whisks viewers away to explore places they’ve never been before, such as diving inside flowers to learn more about the animals that depend on them to live or shrinking to bee-size to explore a hive and discover how honey is made. The educational resources, available on the PBS Parents and PBS Teachers websites, were developed in conjunction with science educators and designed to provide young children with opportunities to explore the science ideas introduced in the programs in the contexts of their own homes, neighborhoods, and schools. Children are also encouraged to visit their local libraries, science museums, aquariums, parks, and zoos to continue their science explorations. Parents and educators will find tips, strategies, activities, and resources to help them engage children in the types of science experiences that form a foundation for future science learning. Activities for parents and teachers that connect programs from the series with specially designed hands-on learning experiences. Activities also include video clips from the programs, definitions of science words, recommendations of books and other resources, and ideas for extending children's science experiences and learning. Viewing Tips for parents and teachers to help promote children's active viewing and learning from the series and connect the science ideas in the episodes with children’s learning experiences at home, in classrooms, and during outdoor explorations. Online Games available on the PBS Kids website for that provide kids with more interactive ways to explore the science concepts in the programs and activities. The Explorer’s Guide and Activities are also available as PDFs for easy downloading and printing. At the beginning of each The Cat in the Hat Knows a Lot About That! adventure, Sally or Nick poses a question about the natural world. Although the Cat knows a lot of things, he doesn't know everything and he's also curious to learn more. In one program, for example, Nick wonders what it would be like to live in a tree all the time. Sally exclaims, “No one can live their whole life in a tree—It’s impossible!” The Cat responds, “Impossible? Is that so?” And off they go to the jungle in the Cat's one-of-a-kind contraption, the Thinga-ma-jigger, to look for animals that live in trees. It's this insatiable curiosity that sparks the friends' adventures. 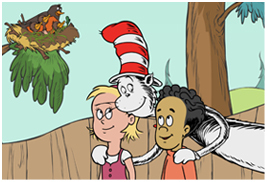 In each program, the Cat in the Hat and his friends Sally and Nick go on a science adventure such as flying with birds to discover how and why they migrate or taking a snowcat to the Arctic to explore freezing and melting. Guided by the Cat, the children figure things out by engaging in science inquiry. They ask questions, make observations, make predictions, plan investigations, collect data, make discoveries, and generate and discuss ideas about how the world works. The television series, which premiered nationally on PBS last month, featuring of course the Cat in the Hat, along with his friends Sally and Nick, use Seussian wit and whimsy to spark a love of learning and an interest in science in preschool-age and Kindergarten children. The first season includes 40 half-hour episodes, and each episode includes two animated adventures, along with short animated clips. The show is voiced by actor Martin Short and produced by Portfolio Entertainment Inc. and Collingwood O’Hare Productions, in association with Dr. Seuss Enterprises, Random House Children’s Entertainment, Treehouse, and PBS KIDS. The presenting PBS station is KQED.